Long ago, before the era of celebrity chefs and their restaurants, the only way to taste a famous chef's food, was to actually go to his restaurant and have a meal there. How things have changed. Nowadays you can go to exclusive "an evening with" events closer to your home. They tend to come at a price however - in Ferran Adria's case the privilege would have set you back a financially debilitating £895 a ticket. 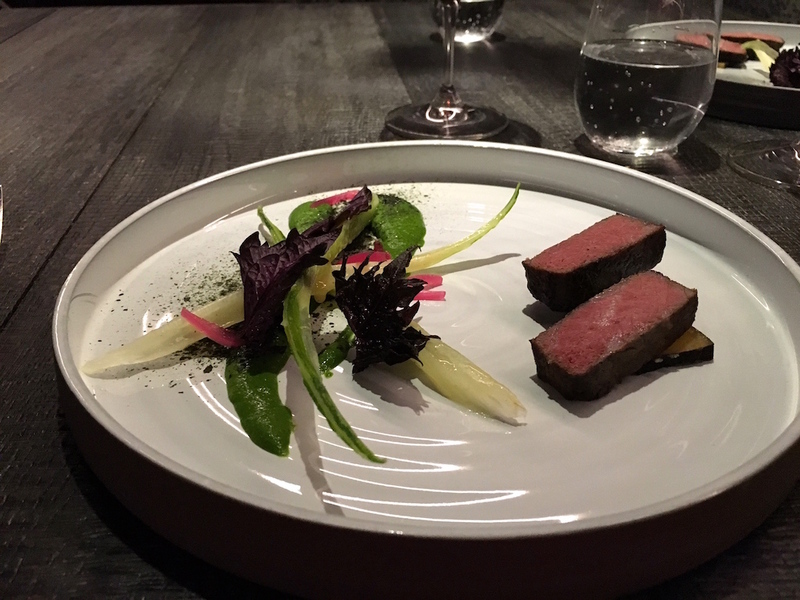 By comparison, the three-day pop-up with Massimo Bottura at Sotheby's in London last year, was a relative bargain at £250 a head. In recent years, gourmet festivals have also emerged, where you can book lunch or dinner, cooked by (often) Michelin-starred chefs from all over Europe or even the world. 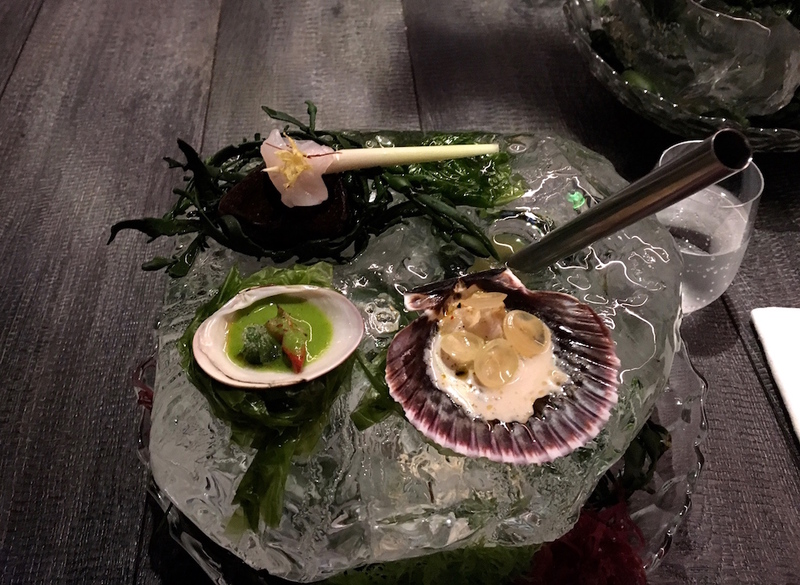 This year Northcote in Lancashire held their two-week Obsession event for the 16th time, featuring chefs such as Hideaki Matsuo of 3-star Kashiwaya in Japan, Annie Féolde of 3-star Enoteca Pinchiorri in Florence and Tom Sellers of 1-star Restaurant Story in London. Another long-running festival is the Rheingau Gourmet & Wein Festival in Eltville am Rhein in Germany. This festival is celebrating its 20th edition this year, and the 2016 line-up once again includes a large number of 3-star chefs, mainly from Germany, but Pierre Gagnaire, Margot Janse and David Kinch are also making an appearance. Prices per meal, including wine, at these festivals range from £120 at Obession to £200-250 in the Rheingau. Also worth mentioning is the "12 Days of Christmas" festival at Christopher Kostow's 3-star Meadowood in Napa Valley, which experienced its 8th edition in 2015. Usually it's just the chef, perhaps his sous-chef and maybe one or two commis chefs who are cooking at these festivals - the show must go on at base camp. Recently however, chefs have been moving their restaurants, lock, stock and brigade, to pop-up, in some cases thousands of miles away on a different continent. The first attention-drawing pop-up of this kind took place in 2012, when during the Olympics Rene Redzepi's Noma took up shop for 2 weeks at Claridge's Hotel in London under the designation "A Taste of Noma". Later that year Alinea and Eleven Madison Park "swapped" restaurants for one week, meaning that diners could enjoy an Alinea meal in New York and an Eleven Madison Park repast in Chicago. Last year saw two high-profile pop-ups. 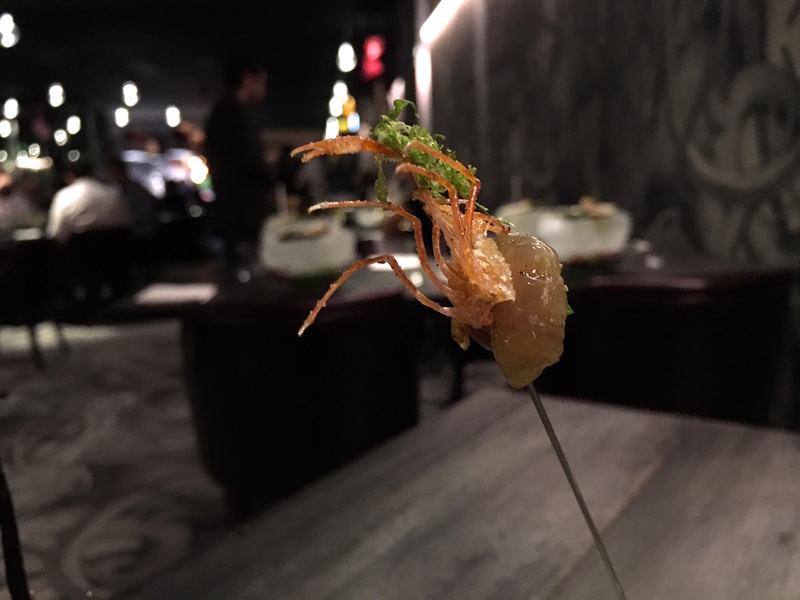 First there was Noma in January, who took up a 4-week residency at the Mandarin Oriental Hotel in Tokyo. 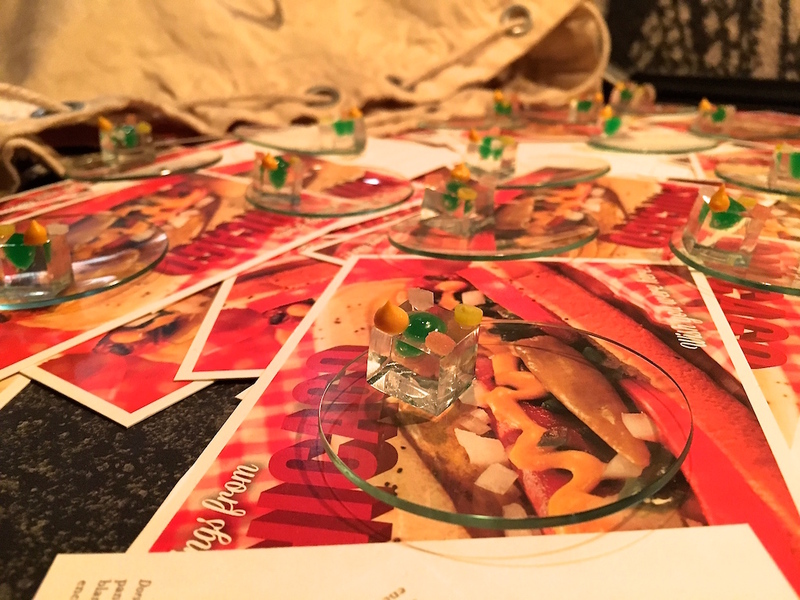 The pop-up was a great success and was extended by two weeks. In february 2015, Heston Blumenthal's The Fat Duck flew down under for a 6-month pop-up at The Crown Hotel & Casino in Melbourne. The permanent residencies of both restaurants were closed for refurbishment during the pop-ups. Tickets didn't come cheap. 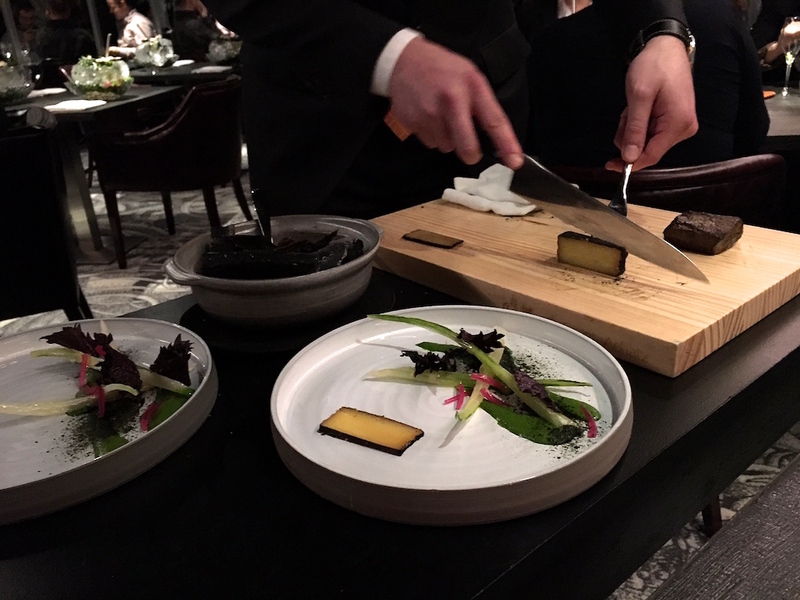 Noma Tokyo was priced at ¥40,200 (around £240) and the Fat Duck at AUD 525 (around £256), but tickets sold out in minutes. 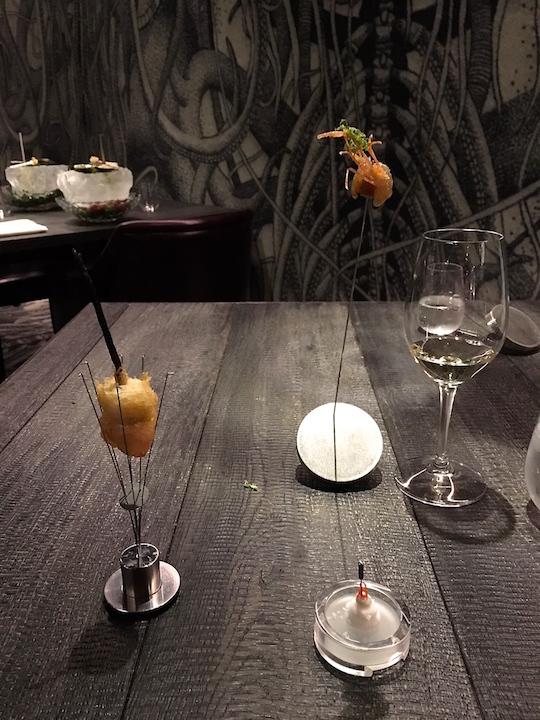 The Fat Duck has since returned home, but Noma clearly got the hang of things. They have just started a 10-week pop-up in Sydney (also sold out in minutes). Joining the pop-up scene too this year is Alinea. Grant Achatz's three-star restaurant just crossed the Atlantic for a 4-week residency at the NH Eurobuilding Hotel in Madrid. The Madrid pop-up ended on 6 February and the next stop will be Miami. Meanwhile, back in Chicago, the restaurant's headquarters are being renovated. Closer to home, Albert Adrià is popping by in London for his "50 Days by Albert Adria" event at the Cafe Royal Hotel. 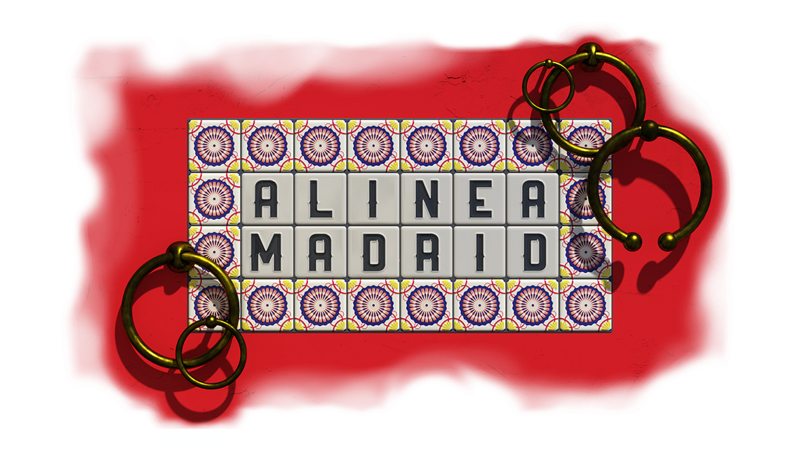 Alinea's pop-up in Madrid was split in two parts. In the first week there was a collaborative dinner with three-star chef David Muñoz, whose restaurant DiverXO houses in the Eurobuilding Hotel. 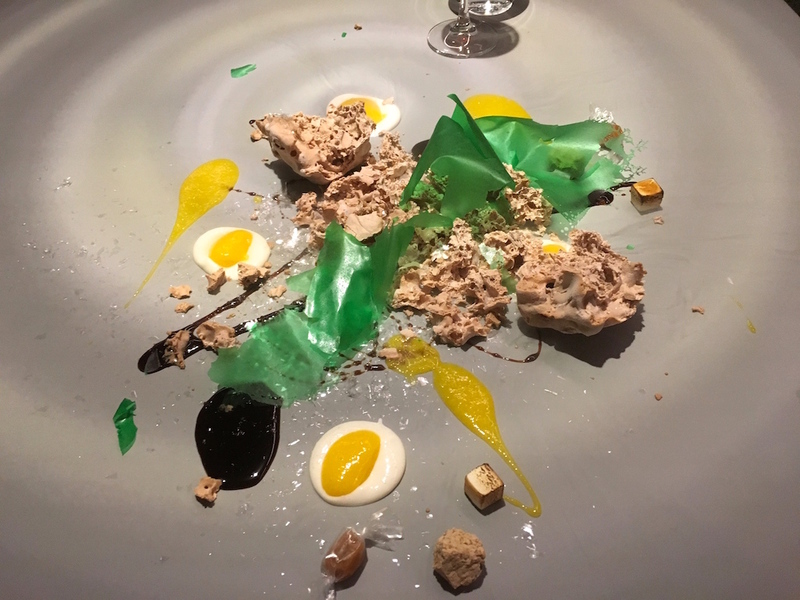 During the next three weeks, Alinea served a degustation menu that would "faithfully represent the Michelin 3-star cuisine of Alinea, while paying homage and honoring the culinary heritage of Spain". Grant Achatz's Alinea has held three Michelin stars since the inaugural, 2011 Michelin Chicago guide, and I've been following Grant Achatz closely for many years. Unfortunately I had never made it to his restaurant in Chicago, so this Madrid pop-up was the perfect opportunity to finally get to sample his cooking and I booked tickets instantly. 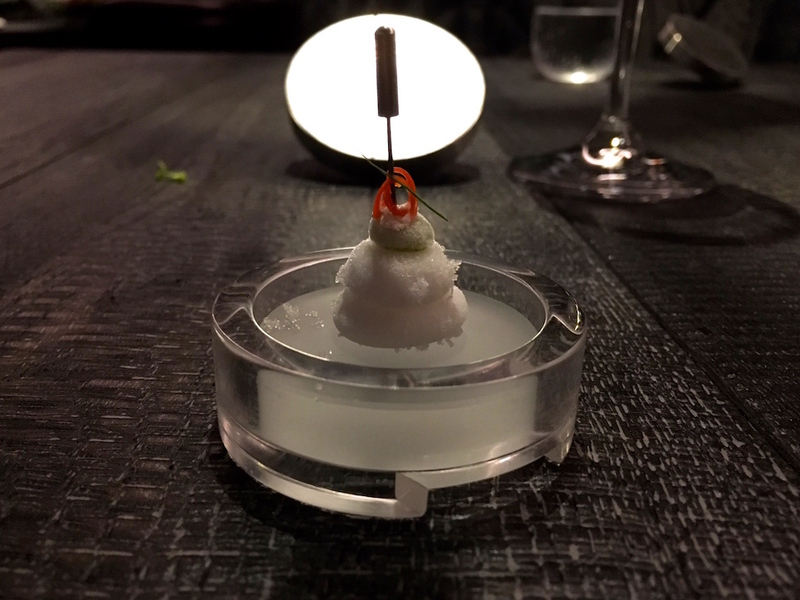 I had dinner with my husband at Alinea Madrid on Friday 29 January 2016. 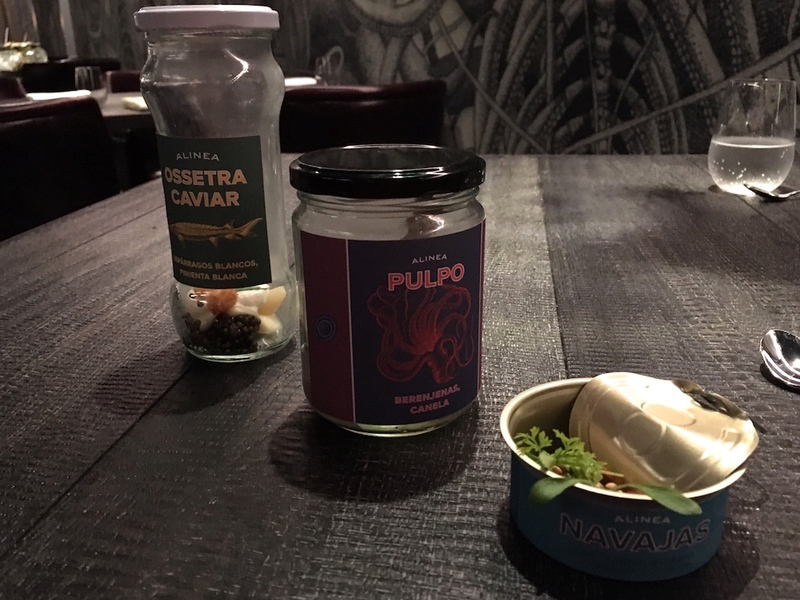 Alinea used their ticketing system for this pop-up, so both the meal and wine pairing (totalling €880 for two - no trifling sum) were paid in advance. When I booked the tickets, the only time that was available was 6pm. Obviously this is ridiculously early in a Spanish context, but as I am from Dutch descent, my Dutch early-bird-genes came in very useful. Since the Spanish like to have dinner after 10pm, I assumed there would be another seating much later that night. So there we were at 5.50 - it would be rude to be late. 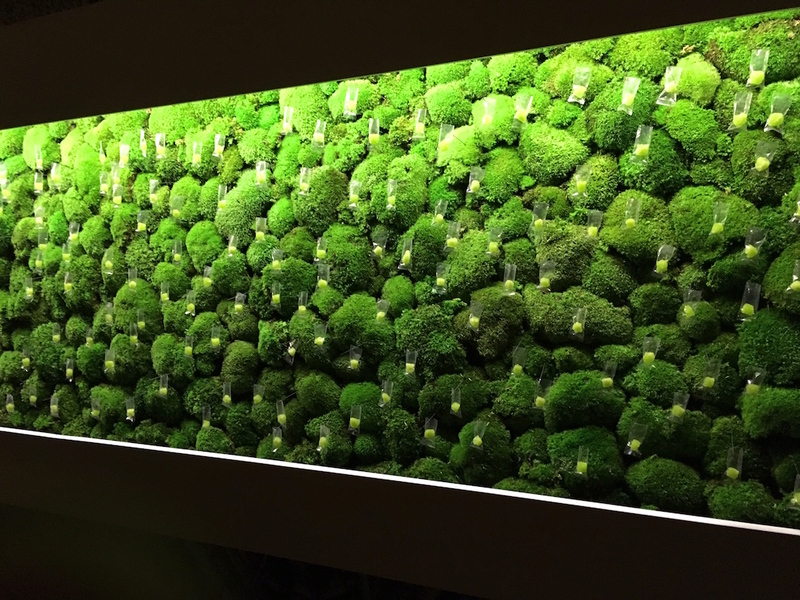 The first thing I noticed when I entered the restaurant space, was a big wall covered in green moss with little transparent bags, which turned out to be the beginning of the Alinea experience. After we had each selected a bag, containing a celery sugar lump, we moved on to the champagne bar, where a soupçon of Ruinart champagne was poured onto the celery sugar. Whilst holding our glasses, we were offered the first bite of the evening, a Chicago Hot Dog (no ketchup!). This was the first two "courses" dealt with. Tonight's menu featured 17 circles in different sizes, the size of each circle indicating the size of the dish. The champagne and "hot dog" for example had a small circle. The menu was only presented to us after the meal, so the circle detail was unknown to me, as were the dishes which were being served tonight. When we arrived at our table, the next dish was already waiting (as it was all the other tables, for that matter). A big block of ice was keeping three seafood bites cool. Sliced scallops came with a white gazpacho, seasoned with Marcona almonds (Ajo blanco? ); clams with a salsa verde and a piece of snapper was served on a lemongrass skewer. A hot stone arrived to cook the snapper on. Hidden inside the block of ice was some delicious pineapple juice. A lovely and elegant start of the meal, and I particularly liked the scallops-gazpacho-almond combination. A couple of minutes later the next course arrived, a course inspired by Spain's high-quality tinned and jarred products. Placed in front me were one tall jar, a medium jar and a small tin. At the bottom of the tall jar was a large, fat piece of white asparagus, topped with an elegantly flavoured white pepper and sesame mousse and a generous helping of Oscietra caviar. There were lovely floral notes from the white pepper and the salty caviar complemented the bittersweet asparagus nicely. The medium-sized jar was filled with grilled octopus pricked on a cinnamon stick, and an aubergine puree, the jar releasing smoke once opened. Nice and tender octopus, and the pungent cinnamon flavours were lovely at first, but after a few bites they became overpowering. My favourite of the three was the tin, which was filled with tender, soy-marinated razor clam, crunchy and citrussy coriander seeds, diced carrot and coriander. This was followed by a dish inspired by an unnamed painting by Joan Miró, dated 2 June 1973, which is part of the collection of the Museo Nacional Centro de Arte Reina Sofía in Madrid. First a print of the painting was placed on the table, which was then covered by a transparent glass sheet. The ingredients on the sheets represented the flavours of a classic Bouillabaisse and red mullet, plated to mirror the painting. A moist and flavoursome piece of red mullet was served on thin, crisp toast and some finely diced vegetables. To accompany the mullet there was a squeeze of bright yellow rouille, and stripes of sweet red pepper puree, zesty orange puree, squid ink puree, basil and parsley puree, and a thick and sugary lavender syrup. An intricate and clever dish with strikingly refined and balanced flavours, each element complementing the mullet beautifully. Next up was Alinea's take on Moqueca, a traditional Brazilian fish stew often made with coconut milk. This dish also showed similarities with Alinea's "Peruvian Scallop" dish. 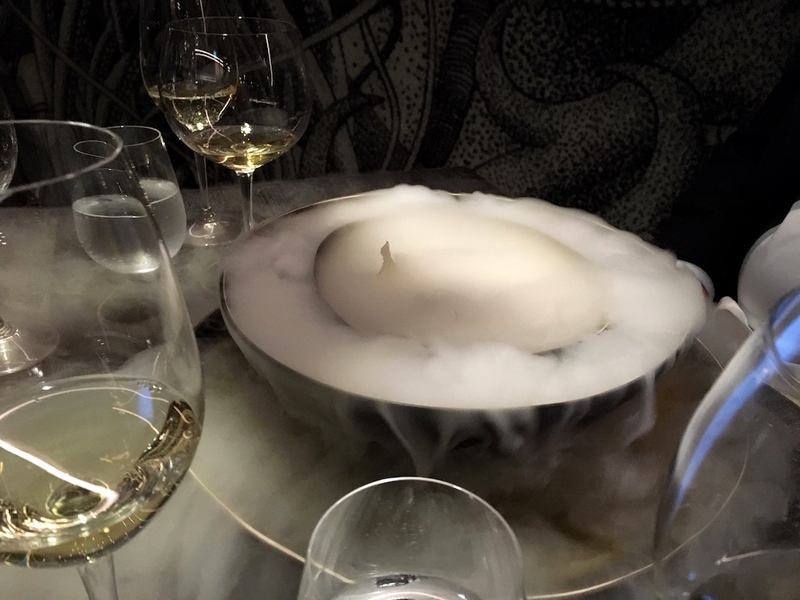 It was served in two bowls, the inner bowl containing the actual dish, and the outer bowl containing dry ice, onto which a liquid was poured to create a yuzu vapour. Once the smoke cleared, a delightful dish of langoustine and seabass ceviche was revealed. 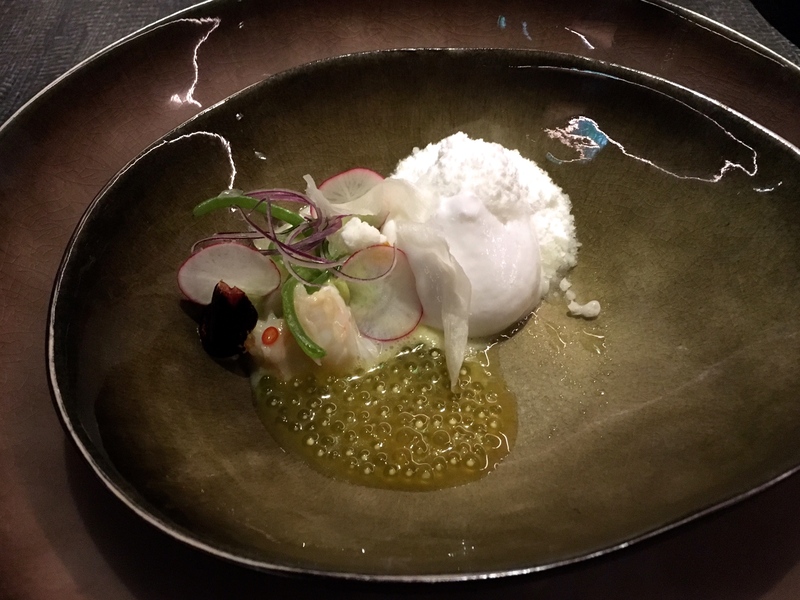 Also in the bowl was a light avocado mousse, some tiger's milk ice (the marinade of the langoustine and seabass), tapioca pearls, surf foam (coconut and salt flavoured foam), thinly sliced radish and red chillies. Altogether an exquisite dish with a great texture and temperature contrast, and I was impressed that the delicate, sweet and silky, langoustine still managed to shine through. A trio of "Flavours of Thailand" nibbles, presented on classic Alinea serviceware, followed. There was a baby shrimp, served with its crunchy shell, tamarind caramel and some shredded mint, and a delicious prawn and green curry tempura perched on a vanilla pod, the latter adding nice vanilla notes. My favourite however, was a frozen "Siam Sunray" (with vivid vodka, kaffir lime and coconut flavours), made with an anti-griddle. 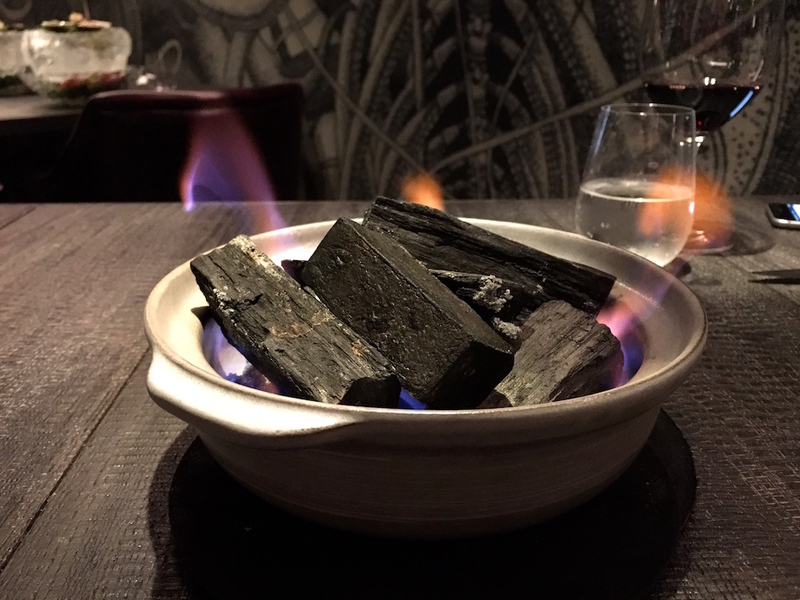 Just before a dish called "Graffiti" was served, a bowl with burning charcoal was placed on our table. Graffiti was explained as "a tribute to Chicago". First to arrive was a brick with various textures and preparations of mushroom, including oyster mushroom meringue, a dark black trompette de la mort mushroom puree, lightly pickled oyster mushrooms, girolle mushrooms, and some pickled onions for extra crunch and acidity. The dish was finished with a spray paint (Graffiti) of parsley and and tarragon juice. A good dish with all the individual mushroom flavours and textures coming through well. The parsley-tarragon juice enhanced the flavours of mushrooms nicely and particularly intensified the aniseedy character of the oyster mushroom. Shortly after it was time for "Hot Potato, Cold Potato", an iconic Alinea dish and also one of the longest running dishes of the restaurant (since 2006, I believe). 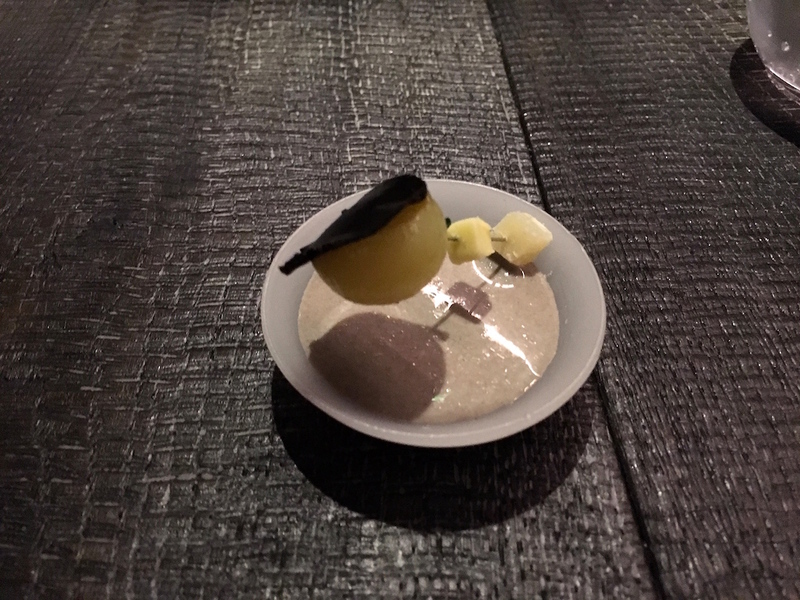 A cold (not ice cold, but room temperature) potato and truffle soup is served in a small paraffin bowl, into which a pin containing a hot baby potato, Parmesan cheese, butter and truffle, is pushed. The idea is to take out the pin, releasing all the ingredients into the cold soup, creating a pleasing hot-cold flavour sensation. The meat course of the evening consisted of two slices of Navarra striploin (cooked in kombu leaf), accompanied by a slice of charcoal potato. Both the beef and potato had been cooking right in front of our eyes in the aforementioned bowl of burning charcaol, which is a fun touch. Also on the plate was some compressed Romaine lettuce, romaine and miso puree, a few shiso leaves, and a sprinkling of nori salt and black pepper. A very satisfying combination of flavours, the compressed lettuce bringing crunch and acidity to the plate. 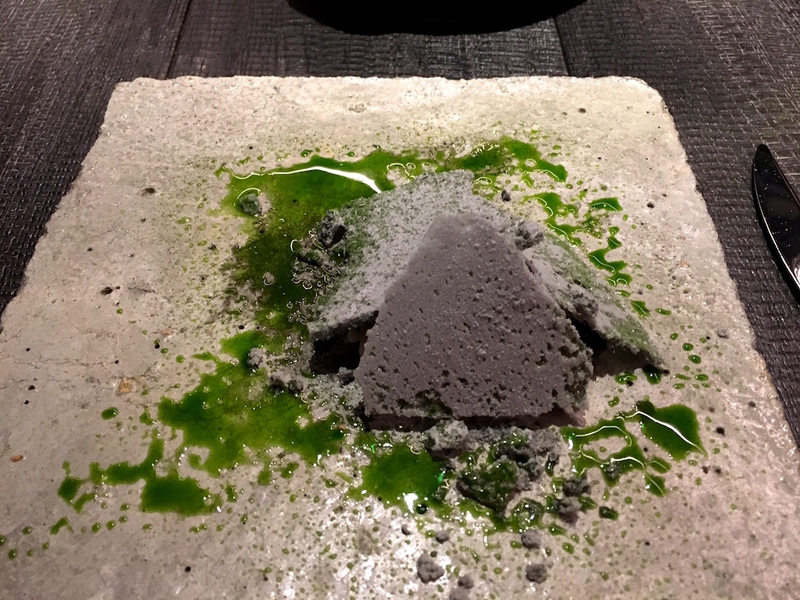 The nori salt was a clever and creative touch and gave the dish a nice, almost toasty finish. The meal came to end with four Alinea classics. 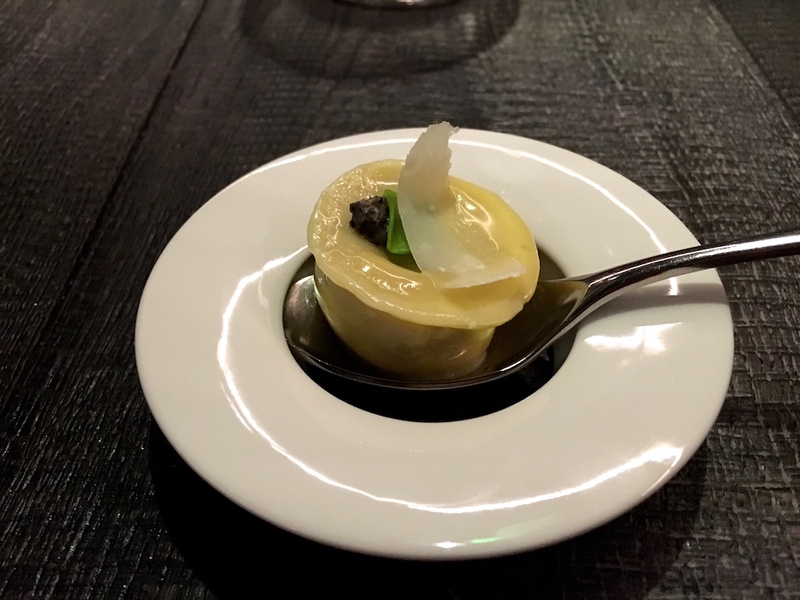 First up was "Black Truffle Explosion", a perfectly made raviolo with a gorgeous liquid black truffle filling, and garnished with black truffle, a cabbage leaf, and a sliver of Parmesan cheese. This was quickly followed by a dehydrated bacon crisp with thin apple ribbons, butterscotch and thyme. A veteran of signature dishes, on the menu at Alinea since the opening of the restaurant in 2005. Next up was an edible, green apple flavoured balloon filled with helium. And finally our table was covered with a silicon mat onto which Grant Achatz assembled/painted a dessert of boozy chocolate reduction (flavoured with rum), allspice cream, mandarin puree, caramelised banana, caramels with edible wrappers, vanilla glitter, frozen milk chocolate, and finally a piece of lime "glass" (which was hanging from a thread above the table). A unique and marvellous dessert where the presentation is decidedly part of the magic, but not at the expense of flavour. With this last course the meal was finished, no coffees, sweets or digestifs, done and dusted in two hours sharp. To be honest, we were offered cocktails at Alinea's pop-up bar The Office, but obviously at eight in the evening the place was more or less deserted. I do realise that restaurants in the US are not known for multi-hour marathon meals, the likes of which you may experience in Europe, but two hours is really pushing it, and I was unaware of this when I booked the table. 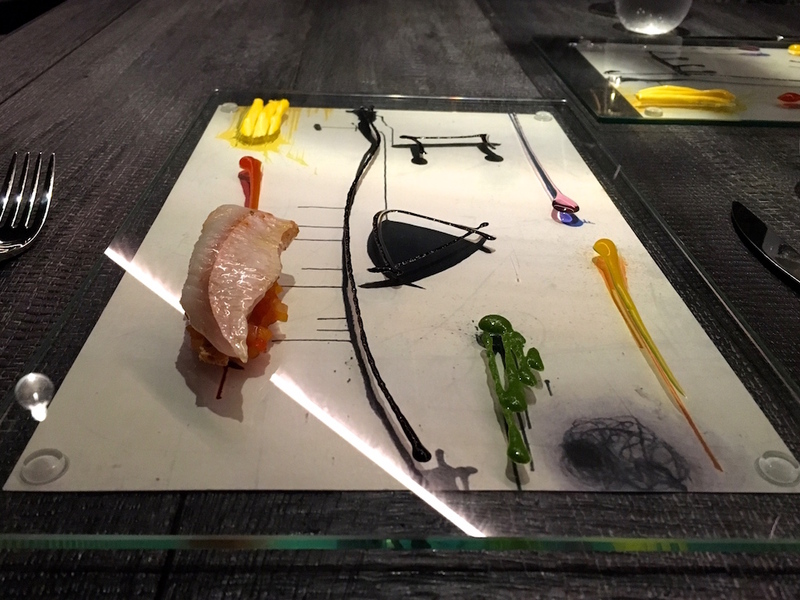 Back home in Chicago, Alinea offers lower-priced tickets for early-bird or off-prime tables, but in Madrid I got to pay full fare - no dynamic pricing here. A nod to old-world sensibilities? Tonight's wine pairing (€275 for two) was pricey, but it offered some interesting and original choices, such as the 2007 Zind-Humbrecht Herrenberg Muscat and the 2012 Pedra de Guix. A little more time to enjoy these wines would have been nice. But let's talk about the food. I guess you could say that my Alinea cherry was popped tonight (sorry, but I couldn't resist). I had an excellent meal, and it was great to finally get to taste some of Alinea's signature dishes, so in this respect my expectations were met. I did sense however, that the menu was on the compact side, and mainly featuring the restaurant's most manageable dishes, leaving out the intricacy, complexity, and elaborateness the restaurant is so well-known for. Tonight I got a taste of Alinea, but I also feel that for a full-on experience I still need to fly out to Chicago. In a way this makes sense, because after all great restaurants like Alinea are very much about time and place. Alinea Madrid was a good but expensive movie, but next time I'll make sure to read the book.